The error vector magnitude (EVM) is a standard metric to quantify the performance of digital communication systems and related building blocks. Regular EVM measurements require expensive equipment featuring inphase and quadrature (IQ) demodulation, wideband analog-to-digital converters (ADCs), and dedicated receiver algorithms to demodulate the data symbols. With modern high data rate communication standards that require high bandwidths and low amounts of error, it is difficult to avoid bias due to errors in the measurement chain. This thesis develops and discusses measurement methods that address the above-described issues with EVM measurements. The first method is an extension of the regular EVM, yielding two results from a single measurement. One result equals the regular EVM result, whereas the other excludes potential errors due to mismatches of the I- and Q- paths of direct conversion transmitters and receivers (IQ imbalance). This can be helpful for troubleshooting, or when measuring a radio frequency (RF) device under test (DUT), where EVM contributions due to IQ imbalance constitute measurement errors. 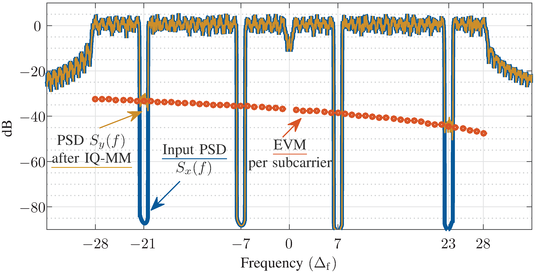 The second method, SLIC-EVM, is an alternative to the EVM that is simpler to adapt to new standards, since it does not require demodulation of the data symbols. SLIC-EVM is based on fitting a linear approximation to the DUT and estimating the power spectral density (PSD) of the modeling error. The measurement methods developed later in this thesis can be motivated by an application of the EVM in the context of digital predistortion (DPD) of a power amplifier: Multi-objective optimization of the EVM and the spectral mask distance leads to Pareto-optimal DPD coefficients. In contrast to conventional methods, the proposed DPD optimization allows for a very low bandwidth in the feedback path. This advantage is, however, foiled by the EVM measurement that requires high-rate ADCs. The noise power ratio (NPR) is a classical metric that can be measured without high-rate ADCs. The third measurement method, called the error power ratio (EPR), shows that the EVM can be estimated based on the principle of the NPR for typical analog transceiver impairments like additive noise, phase noise, nonlinearity, and IQ imbalance. Besides measurement results of a wireless LAN power amplifier, Monte-Carlo simulations indicate that the EPR predicts the EVM well for various impairment scenarios. There is however an important constraint. The frequency response of the system and the error must be well-behaved, as derived and specified mathematically. The final method, the swept EPR (SWEEPR), overcomes this constraint and allows for estimation of highly frequency-dependent EVMs. An EPR test signal features constant stopband locations, within which the error is measured. The key idea of SWEEPR is to use a linearly-swept stopband center, covering the entire bandwidth of the signal. A swept-tuned spectrum analyzer, which is available in most RF labs, is the perfect device for SWEEPR analysis. By synchronizing the analyzer sweep to the stopband sweep, it is possible to measure the power within the stopband, and, by delaying the sweep, outside of the stopband. The ratio of the stopband PSD to the inband PSD estimates the EVM, which is shown analytically and verified with measurements. Summing up, this thesis presents alternatives to standard EVM measurements that excel with their simplicity, accuracy, and generality. The derived theory and results represent a big leap to the current state of the art of EVM estimation and signal- to-noise and distortion ratio measurement based on best linear approximation and PSD measurement. Furthermore, this thesis reveals limitations of traditional NPR measurements that are ultimately overcome with the proposed SWEEPR method. The fulltext of this thesis can be found here.